GIC Water Systems utilizes the latest well and borehole logging equipment on the market with the capability of conducting logging surveys down to 2000 feet. Borehole geophysical surveys are conducted with equipment manufactured by Robertson Geologging Limited. Borehole geophysical survey data can be provided upon request in ASCII format on a CD-ROM disk, printed color copies, or saved/emailed in adobe file format. In support of our aquifer testing projects, GIC Water Systems also owns several gauged and absolute pressure transducers and data loggers from In-Situ, turbidity meters, and others water quality meters / test kits. The following is a list of geophysical sondes currently owned by GIC Water Systems. Other sondes can be obtained by GIC if needed. 8, 16, 32, 64 inch Normal Resistivity and Single Point Resistivity, Natural Gamma, Self Potential, Temperature and Fluid Conductivity, 3- Arm Caliper Log, and a High Resolution Impeller Flowmeter Log. 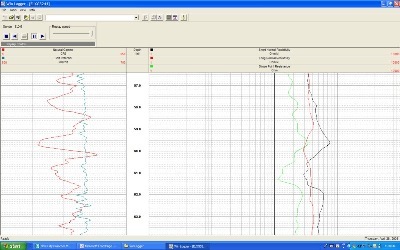 Below is an example of a log recorded using Robertsons Win Logger software.